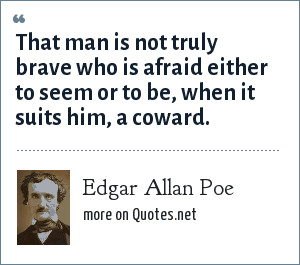 Edgar Allan Poe: That man is not truly brave who is afraid either to seem or to be, when it suits him, a coward. "Edgar Allan Poe Quotes." Quotes.net. STANDS4 LLC, 2019. Web. 18 Apr. 2019. <https://www.quotes.net/quote/49902>.